As my second show at the Fringe I walked in having no idea about what to expect; all I had to go on was something about a murdered audience member. Within the first five minutes my cheeks were aching from laughter. This two-man show brings back the true meaning of showmanship! The lights come up to reveal the characters of Walter and Bruce, a travelling duo of entertainers. Their main purpose is to entertain with song, dance and maybe even some magic. However, Bruce gets distracted easily, especially with a guilty conscience. Walter does his best to get on with the show; however, Bruce seems to halt the process. The ever-entertaining dynamic between the two will have you laughing almost constantly. 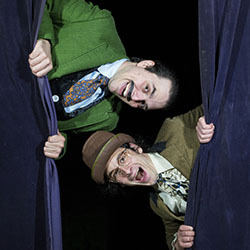 The characters of Walter and Bruce are a show pair that has that old-style vaudeville charm. Jumping up and down with boundless energy and expressing a wide range of full-out emotions and changing in an instant is extremely impressive. The energy emitted by these two was amazing to watch. I kept thinking the show was about to end because they seemed to be at the pinnacle of their energy output, but no! They delighted me and kept going for a full 60 minutes! They do a hilarious shadow puppet show explaining their past history and the meaning behind the phrase “Perpetual Wednesday.” These two have been together for a long time: the backstory is that they are cursed, magical and immortal. Their curse is that anything they set out to accomplish will end in failure. Going through history, they explain that they were really the cause behind some of history's big mishaps, starting with the Sphinx’s nose. A little dark comedy and with lots of buffoonery, slapstick, and pizzazz, you grow fond of them both while watching their antics. Bruce’s trusting innocence and Walter’s determination and embarrassment for his partner make you identify and sympathize with them in their efforts to perform a successful show. Perpetual Wednesday is sure to leave you feeling grateful, perplexed, and thoroughly entertained. I couldn’t stop smiling afterward and I’m pretty sure I walked around with an extra bounce in my step. These actors really give their all in this performance.